Many of you have asked how I maintain my hair for that smooth and healthy shine so today I’m sharing some thoughts on hair oils and dryers I’ve put to the test. I’m always trying new things in hair care as I have thick and unruly hair that requires heat styling and product to smooth out the frizz. Over the years I have tried dozens of creams, sprays and oils over the years and my favorite items are the multi-tasking ones. In my experience creams are best for adding a bit more texture and shine, sprays are great to evenly disperse product through the hair and comb through, oils are a good in-between kind of option. Finding the right hair dryer can be tricky and take time. It took me a long time before I was willing to spend over $100 on one but doing so was life changing and worth every single penny. Even though a high price tag can be off putting, I would say don’t let the price tag scare you. There are a number of hair dryers that do make it possible to get a perfect salon quality blowout at home. Today I’ve teamed up with Sephora to share thoughts on three new-to-me hair oils and how they compare to some others I’ve tried. I was also able to put two hair dryers to the test and have a pros and cons list on each. Up first is a look at some of the oils. Smell is extremely important to me as I have a sensitive nose and usually prefer something that isn’t too strong so it won’t interfere with my perfume of the day. In terms of texture I like oils that have more of a lightweight finish so it won’t weigh down my hair as the day progresses. Moroccanoil Treatment has been a long-time staple because it’s versatile and works every time without fail to help detangle and tame flyaways. I love the argan oil scent and it’s one that I can use without having to worry about it weighing my hair down. Thoughts comparing six different oils below. Ouai Hair Oil ($23 for 1.7 oz) is a lightweight oil designed to control frizz, nourish hair and protect hair from color fading. It is indeed a luxurious rich oil but comes with a floral scent that I’m not a huge fan of. It’s not a deal breaker for me but if it had a different scent I would reach for it more frequently. The best part of the oil is the packaging. It comes in a pretty package and the pump is well designed to dispense just the right amount of product. Living Proof No Frizz Nourishing Oil ($38 for 3.4 oz) is described as a fast-absorbing oil and is designed for coarse hair. You can scroll down to the bottom of this post to see what my hair looks like with one drop. It’s described as a nourishing oil and for my hair it did add a nice healthy shine. It has that signature fresh scent all living proof hair products have but is light and doesn’t overwhelm you. Texture was easy to work through the hair – Living Proof has something they call OFPMA technology incorporated into this to block frizz and lower surface tension to help formula spread evenly. It does exactly what it claims without making the hair feel heavy. I did need to add one more pump after drying on the ends to help seal and smooth split ends. Moroccanoil Treatment ($34 for 1.7 oz) is a classic I would say everyone should try, if you have thicker, dry or coarse hair. The only downside is that these do not come with a pump which would make application easier. After using this pre-heat treatment the hair is easier to manage as it acts as a detangler and hair is soft and shiny. It does work to strengthen the hair as well. Moroccanoil Treatment Light ($34 for 1.7 oz) is similar to the regular one, if you have fine hair or oily hair, this will probably be the better option for you. For my thick hair this works just as well but has a noticeably lighter texture and finish. When I use this hair is light and fluffy but frizz-free. Both the oils cut down drying time with a dryer. Madame C.J. Walker Beauty Culture Scent and Shine Coconut Oil ($26 for 1.7 oz) is a strongly scented oil that smells of sweet coconut and vanilla. I am normally not a fan of sweet scents for the hair but if you look at the reviews on Sephora there are a lot of other women who love it. This one has a thinner texture and absorbs quickly into the hair. For those with curly hair it’s supposed to maintain your curls but since I style my hair straight I can’t report on that aspect. As a finishing product it makes the hair ends look super healthy. If you like vanilla scents I think you will love this. For me it’s too strong to wear throughout the hair but I can apply it on the ends as a finishing product. Verb Ghost Oil ($14 for 2 oz or $18 for this duo set) is one I bought a few weeks ago because I was researching hair products online and this looked really interesting to me. It’s a clear restorative oil with a moringa oil blend which is great for dry or damaged hair. It smells amazing – it’s hard to describe but I would describe it as fresh and lightweight. It is one of the best lightweight oils I’ve tried that really almost disappears into the hair as it absorbs quickly and blends nicely into the strands. It does what it claims: removes frizz, smooths hair and adds shine. Next are three dryers from T3, ghd and Drybar. When it comes to dryers aside from overall performance I’m also concerned about noise level and weight. Since I have thick hair I sometimes dry my hair in sections or layers from the bottom to the top which takes extra time. Finding a dryer that isn’t too heavy is important so it doesn’t weigh down my arm. The noise level is something I take for granted until I use one in a hotel on a trip and realize how loud the motors are. T3 PROi Professional Hair Dryer ($350) is the most expensive hair dryer I own and I’ve had for over a year now. It was in my top 2 dryers for giving my hair a salon quality blow out. It has a Tourmaline and Ceramic electric ionizer designed to emit negative ions and infrared heat to help seal ends and eliminate frizz. There are two nozzles with a wide and narrow tip that allow you to concentrate air in different ways. It truly does work to give you an amazingly smooth blowout. There are three heat setting options, a cool shot button and two speed settings which is great for those who want more control. The aesthetics and design are amazing. This is the prettiest dryer I own. I’ve tried a number of other T3 dryers and found them just ok but the PROi works a lot better than the rest. Even though it’s on the large side it isn’t too heavy. The noise level is low which makes it pleasant to use. Two downsides include the size and dry time. This is a full size dryer which means it will take up a lot of counter or drawer space. It also means it’s not travel-friendly. This isn’t necessarily a deal breaker but as someone who prefers tools that are more compact this is larger than I would like. Still it performs well and I’ve found space to store it. The other downside is dry time but I will say there is a trick to using this one. Most of the complaints I’ve seen online is that for the price this should cut down dry time but many have reported it does not. It has a powerful motor which does emit a lot of concentrated air but if you blow dry your hair from the time it is completely wet it will take extra time. The trick to cutting down dry time is to make sure your hair is towel dried and to rough the hair first. This may seem like an extra step but it will only take a few minutes and getting it roughly dried to about 80% as they recommend makes a huge difference for the remainder of the drying process. After rough drying divide the hair into sections and dry them with either of the nozzles. I’ve used this a number of ways and will say that I usually don’t mind how long it takes to dry my hair as long as the results are good. This one gives smooth frizz-free full looking hair every time. ghd Air Professional Performance Hair Dryer ($199) is new to me and quite impressive. It’s smaller and more lightweight than the T3 but is the motor has a smoother quieter sound and yet emits a stronger feeling air stream by comparison. This one truly cuts hair drying time up to 2x faster like it claims. It has ionic technology to keep hair free from frizz and give a smooth finish. There are two heat settings plus a cool option, a cool shot button and two speed settings. The nozzle tips are skinnier which help force air into a more concentrated flow. Dry time is at most 10 minutes but I was able to cut it to down to 7 minutes from towel dried to completely dry. I can’t think of any cons with this one although the nozzles can be a bit hard to remove. Once they are on they are locked in pretty tight – but the upside is that they don’t move around easily if you run your hair through a stiffer brush. 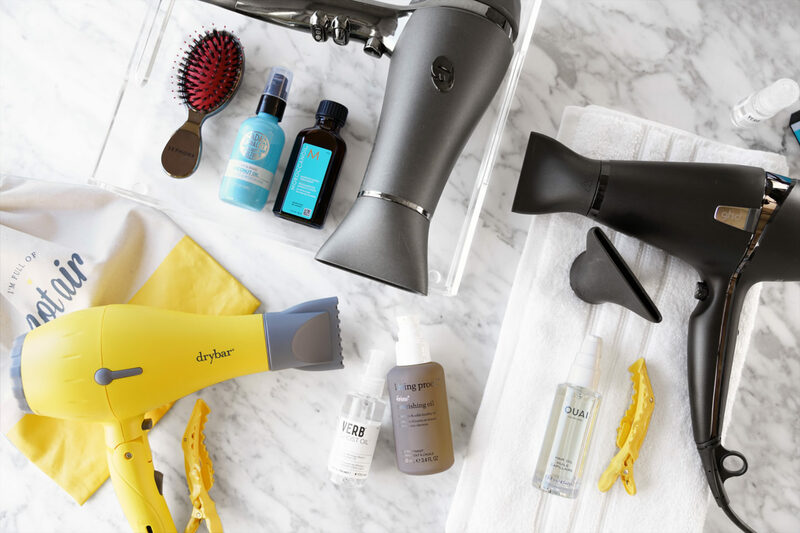 Drybar Baby Buttercup Blow Dryer ($135) is one of the cutest hair tools I’ve seen. My husband actually bought me the full size Buttercup Dryer quite a few years ago and I liked it a lot but it took forever to get my hair dry with it. I’ve mentioned that long dry time isn’t a deal breaker but sometimes having something that gets the job done 2-3 minutes faster makes a huge difference. I was eager to see how the Baby Buttercup compared and think it’s better than the full size. It does have a louder motor compared to the T3 PROi or ghd air professional but it’s not too loud that it bothers me. Since this one is smaller and more compact they’ve combined the heat and speed settings into the same button. It’s a powerful one even though it’s small and dry time is pretty quick with this. I love that it folds into a compact size and comes with it’s own drawstring bag that says “I’m Full of Hot Air” which is perfect for travel. Performance-wise it’s a lot better than the T3 Featherweight Compact Folding Dryer which I bought a couple years ago but I know a lot of others really like that one. The Drybar Baby Buttercup has better drying power, cuts the drying time, doesn’t dry out the hair and gives a nice smooth blowout. The only downside is since it’s small the options for heat and speed are limited but that’s expected with the compact design. It gets the job done and is one I’ll be taking with me on my trip this upcoming week. Blow out how-to before and after with the Living Proof No Frizz Nourishing Oil and ghd Air Professional Performance Dryer. Total time from towel-dried hair to a completely smooth blowout was around 8 minutes. For oils I usually apply 1 to 2 pumps from ends and work my way up. Note there are a number of ways to blow dry your hair. I often use clips to divide and section my hair but sometimes parting it without clips works too. In terms of the three dryers I featured it’s hard to pick a favorite as they each have their own benefits. The T3 PROi performs well and gives amazing results but dry time can be longer than what you may want. The ghd Air Professional is one of the most powerful yet compact dryers I’ve tried and truly cuts down dry time while giving smooth looking hair. The Drybar Baby Buttercup is great for those who don’t need a lot of options for heat/speed and want something compact or travel a lot. If I could only have 1, I would say the ghd is what I’d gravitate towards for dry time although I really like the larger size of the T3 nozzles. For oils I think finding the right one depends on your hair density, hair length and whether or not you color your hair. My personal favorites are still the Moroccanoil regular and light, but I’ve been really impressed with the ones from Living Proof and Verb. This post was sponsored by Sephora. As always all opinions my own.